Your best Vancouver driving school. Kitsilano Driving Academy specializes in providing in-car-driving instruction to new, inexperienced or foreign drivers pursuing class 5 or class 7 BC Drivers licenses. We teach our students how to build and maintain superior driving habits through patience, encouragement and support. All lessons are conducted in our vehicles equipped with a passenger side steering wheel and full dual controls, for increased safety during instruction. 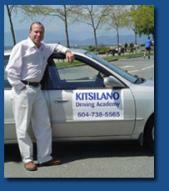 Kitsilano Driving Academy is located in Vancouver, BC and we can arrange for a door-to-door pickup. Our driving school will help with road test preparation using our dual control car with two steering wheels. Enjoy driving lessons with our instructors and get the best score on the Road Test in Vancouver, BC, Canada. Your nerves will thank you and so will we. Keywords: Vancouver Driving School, Driving School In Vancouver, Driving Lessons, Driving lesson, driving instructor, driving instructors, dual control car, two steering wheels, road test, failed road test, road test preparation, road test help, Vancouver, BC, Canada.